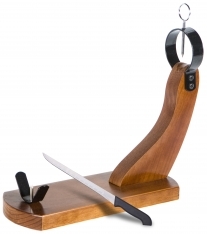 Ham obtained from the hindquarters of acorn-fed iberico pigs.This ham is characterized by its stylized form, its black hoof and its marbling. The colour is red with pinkish hues and the flavour is intense, prolonged and unique. In Spanish, this product is called, "Jamón ibérico de bellota DO de Guijuelo Revisan Ibéricos entero." 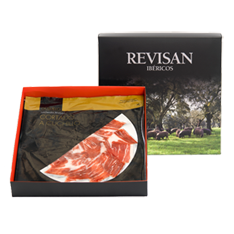 Format : This acorn-fed iberian ham is presented in individual boxes, wrapped in special paper, in a black cotton sack and red mesh. Consumption : Consume within one year of purchase.